Trouble with your Blue Springs Bathtub Plumbing? At Kevin Ginnings Plumbing Service Inc., we’ve seen our fair share of Blue Springs Missouri bathtubs, and we’ve seen every possible problem they can have. Let us take the expertise we’ve gained since 1985 and make it work for you. Do you have a foul odor coming from your bathtub drain? You likely need a new trap, which is a component of bathtub pipes that keeps the sewage smell from wafting out of the tub drain. On the other hand, if your Blue Springs bathtub is clogged, we may need some more troubleshooting. Bathtub drains become clogged with everything from dirt and hair to mineral deposits. Rest assured, when the Blue Springs bathtub experts at Kevin Ginnings Plumbing Service Inc. have spotted the problem, we’ll waste no time fixing it. One problem many people face with Blue Springs plumbers is unprofessional service. Many of these plumbers think that since you’ve hired them to fix your Blue Springs bathtub, you need them and you don’t have any other choice. You do have options, though... and your best choice is to call Kevin Ginnings Plumbing Service Inc.. We’re grateful to our community for keeping us in business since 1985, and we express our gratitude through friendly service. 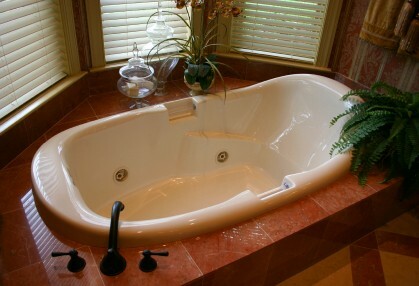 If you need 24/7 Blue Springs Missouri bathtub service, let us help at any time. Whether it’s too early in the morning or too late at night, we at Kevin Ginnings Plumbing Service Inc. always make ourselves available to our customers. Kevin Ginnings Plumbing Service Inc. is a team of Blue Springs Missouri bathtub experts who can fix your faucet, drain, clogged pipes, or anything else. Just call us at (816) 832-4322 as soon as possible for a free estimate!